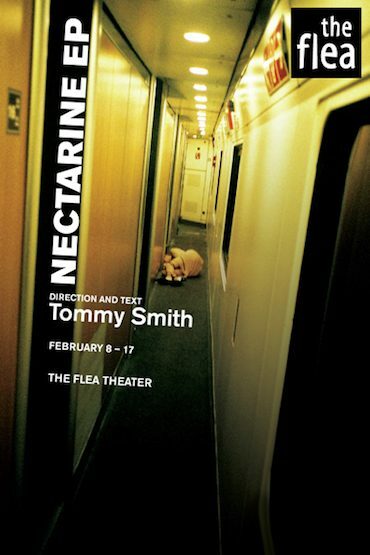 The Flea goes audio with the upcoming workshop production of Tommy Smith’s NECTARINE EP. A sonic reverberation of Homer’s The Odyssey – filtered through the lens of downtown artist Tommy Smith – the audio-fueled “extended play”, NECTARINE EP, de-stimulates the audience’s perception through visual and auditory manipulation. This experimental production is both written and directed by Tommy Smith and features The Bats, the resident acting company at The Flea. NECTARINE EP features additional direction by Tom Costello and Benjamin H. Kamine. Original Music by Reggie Watts, John Osebold, and Michael McQuilken. Sound Design by Michael McQuilken, and Lighting/Projection Design by Sarah Lasley. The cast features Jamie Bock, Jenelle Chu, Jessica Frey, Marlowe Holden, Christine Lee, Cristina Pitter, Michelle Silvani, Lulu Ward and Mari Yamamoto. Tommy Smith’s plays include PTSD (Ensemble Studio Theatre; d. Billy Carden), WHITE HOT (Here Arts Center; d. May Adrales & West Of Lenin, d. Braden Abraham), PIGEON (Ensemble Studio Theatre; d. Billy Carden), THE WIFE (Access Gallery; d. May Adrales), SEXTET (Washington Ensemble Theatre; d. Roger Benington), CARAVAN MAN (Williamstown Theatre Festival, music & lyrics by Gabriel Kahane, d. Kip Fagan), DEMON DREAMS (Magic Futurebox, music by DJ Spooky, d. Kevin Laibson), A DAY IN DIG NATION (PS 122, co-written and d. Michael McQuilken), AIR CONDITIONING (Eugene O’Neill Playwrights Conference; d. Steve Cosson), among others. In addition, his award-winning theatrical collaborations with Reggie Watts played at The Public Theatre, Lamama, The Warhol Museum, MCA Chicago, ICA Boston, On The Boards and PICA: TBA, among others. As a director/writer, Tommy recently created the environmental sound performances, LOTUSEATERS EP (for IRT Theater, with voices of Neil Gaiman, Marin Ireland & Reed Birney) and FORTH (for MFB, d. Meiyin Wang). Tommy is the recipient of the PONY fellow at The Lark, a two-time winner of the Lecomte du Nouy Prize, a recipient of the E.S.T. Sloan Grant, a winner of the Page73 Productions Playwriting Fellowship, a recipient of the Creative Capital award and a member of the Dorothy Strelsin New American Writer’s Group at Primary Stages. Publications include PIGEON for Dramatists Play Service and WHITE HOT in the New York Theatre Review. His feature film FIGMENT was optioned by Ridley Scott’s production company ScottFree. He is a graduate of the playwriting program at The Juilliard School. He lives in New York City. Tom Costello is a Resident Director at The Flea where he recently directed The Wundelsteipen (and other difficult roles for young people) by Nick Jones. Other credits include Pipeline Theatre Company’s productions of Sleepless City by Tim Chawaga, Shakespeare the Dead by Alex Mills (Dream Up Festival) and Bubble and Squeak by Evan Twohy which was a finalist in the 2011 Samuel French Off-Off Broadway Festival. He has also directed numerous productions for Atlantic Acting School, where he is a faculty member. Tom received his BFA in Drama from NYU/Tisch. Benjamin H. Kamine recently directed the world premiere of Thomas Bradshaw’s Job at The Flea (Timeout Critics’ Pick, “a jolting treat” – Ben Brantley, New York Times). Other directing credits include Medea’s Got Some Issues by Emilio Williams (Best International Show 2012, United Solo Festival at Theater Row), Why Me? by Leah Nanako Winkler (Asking for Trouble at EST) and the upcoming The Man Under by Paul Bomba (59E59). He is a resident director at the Jewish Plays Project and is a member of the Lincoln Center Theater Directors Lab. He also works throughout New York as a sound, lighting, and projection designer, and is a Guest Artist at the Lab School for Collaborative Studies. Previous directing credits for The Flea: The Flying Latke by Arthur Yorinks (2011, 2012); Kathleen Supove and the Electric Sheep; The Shakes: The Honest Whore, Act 4; #serials@theflea: Me, My Girl, and My Grandpa Shmulee by Dan McCabe; Dave Koresh Superstar by Robert Askins (Reading).